Zinc and magnesium deficiencies are due to several factors that increase the loss of these critical minerals and also decrease their uptake from food. Loss of these minerals occurs through sweat and urine, plus an increased use for recovery and protein synthesis. Reduced uptake of these minerals can happen due to refined sugars and white-flour products, alcohol consumption, calcium-rich foods like dairy, copper, as well as foods rich in phytates (phosphorous compounds found in whole-grain breads, cereals, and legumes). ZMA JYM is designed to work with Vita JYM, which purposely doesn't include zinc and magnesium to promote better absorption of other critical vitamins and minerals, and to prevent you from getting too much zinc and magnesium. On the other hand, researchers from the USDA reported that zinc depletion decreased muscle endurance in subjects. This means that maintaining optimal zinc levels is critical for your ability to complete a number of reps with a given weight. Other Zinc and Magnesium supplements make these five critical mistakes, JYM makes no such sacrifices. ZMA JYM is not just zinc, magnesium, and vitamin B6 thrown into a bottle. ZMA JYM contains specific forms of these minerals that enhance their uptake and utilization by the body. ZMA JYM specifically uses zinc mono-L-methionine, and aspartate and magnesium aspartate. This is critical because there are two forms of zinc monomethionine: zinc mono-L-methionine and zinc mono-D-methionine. Only the "L" form is readily absorbed and used by the body. The human body is not able to use the "D" form. Some bogus products use a combo of both the "L" and "D" form. The D form actually inhibits the absorption of the L form and undermines zinc uptake. If a product does not specifically list zinc mono-L-methionine, and instead lists zinc monomethionine, don’t bother with it. An easy way to ensure that a product uses real ZMA is to look for the SNAC System trademark listed on the bottle. Anything else is an imposter. Many bogus products grossly under-dose the zinc and magnesium. A properly dosed product will provide 30 mg of zinc mono-L-methionine and aspartate, 450 mg of magnesium aspartate, and 10.5 mg of vitamin B6 per dose. 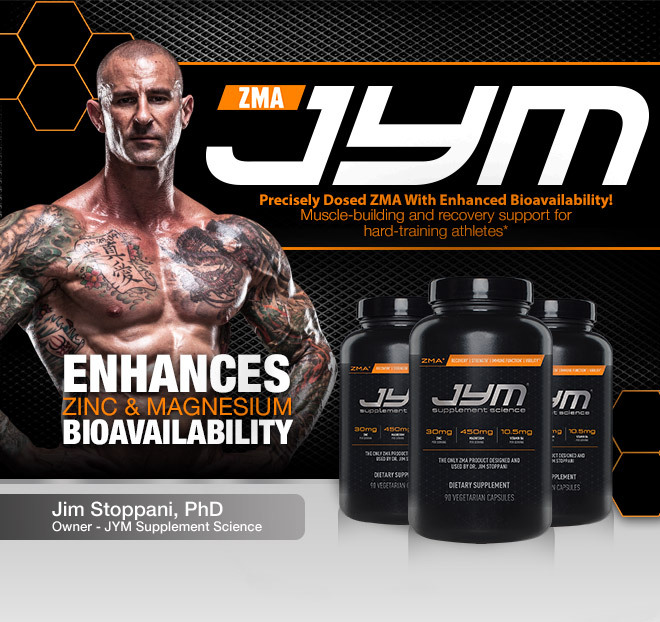 * In the case of ZMA JYM each capsule provides precisely 10 mg zinc mono-L-methionine and aspartate, 150 mg of magnesium aspartate, and 3.5 mg of B6. With the full 3-capsule dose of ZMA JYM, that’s 30 mg zinc, 450 mg magnesium, and 10.5 mg of B6. Some products add extra ingredients to help support testosterone levels. Unfortunately some herbal ingredients used to support testosterone can inhibit the absorption of zinc and magnesium. Plus, most testosterone-support ingredients should be taken with food, while Zinc and Magnesium products should be taken without food. If you want to optimize your testosterone levels, take a separate testosterone support such as Alpha JYM. Many products add extra ingredients to help promote sleep. Common ingredients include melatonin, L-theanine, and 5-HTP. The problem with this is that you shouldn’t always need a sleep agent before bed every night. Yet if the product you’re using includes any supplements that help to enhance sleep and relaxation, taking them every night can leave you dependent on these agents, which is the last thing you want. A proper Zinc and Magnesium product focuses on just providing you real support without any sleep agents. If you need help sleeping for a period of time, then buy a separate sleep supplement. Many products actually add other minerals to the formula. Two common minerals you may see are copper and calcium. This is counterproductive because calcium interferes with zinc uptake, as does copper. As critical as these minerals are, you should be taking them at separate times of the day, not with your Zinc and Magnesium supplement. As mentioned, Vita JYM is strategically devoid of zinc and magnesium because you want to supplement those two minerals at a separate time from other minerals. Plus, you do not want to supplement with too much zinc or magnesium, which is counterproductive. Vita JYM also supplies you the proper amount of copper you need in relation to zinc, which needs to be taken at a specific ratio for best results. * Vita JYM is also devoid of calcium, which interferes with the absorption of numerous minerals. Pro JYM, my high-quality protein powder blend, provides you ample calcium (400 mg per serving). Let’s take a closer look at each of the 4 ingredients and doses used to make ZMA JYM the athlete’s perfect Zinc and Magnesium supplement. Magnesium is an essential mineral involved in numerous reactions in the body. Vitamin B6 is a water-soluble vitamin that is a cofactor in many reactions in the body. It’s involved in the synthesis of neurotransmitters, histamine, and hemoglobin.